Germany is a key driver of wholesale price and margin dynamics across NW Europe. This is a result of market scale, high levels of interconnection and the export implications of aggressive renewable build. The UK on the other hand is still a relatively isolated power market, but a key test case for capacity market implementation. A comparison between Germany and UK generation margin sheds light on many of the challenges gas and coal plant owners face across Europe. Comparisons between Germany and the UK are always an interesting exercise. Germany is impressive in its efficiency, structured approach and longer term thinking. The UK prides itself on flexibility, independence and innovation. Interesting contrasts between Germany and the UK can be extended across business, culture and food. For example, a shared passion for beer and sausages (but of very different styles) is worthy of an article in itself. But this article focuses on a comparison of generation margins in the German and UK power markets. Germany is a key driver of wholesale price and margin dynamics across NW Europe. This is a result of market scale, high levels of interconnection and the export implications of aggresive renewable build. The UK on the other hand is still a relatively isolated power market. But it is a key test case for the future of conventional generation margins in Europe, given that the UK is leading the European push to implement capacity markets. A comparison between Germany and the UK sheds light on many of the challenges gas and coal plant owners face across Europe. An historical chart of German power prices resembles a descent down a steep mountain. A rapid increase in renewable capacity, combined with falling coal prices and relatively weak post financial crisis demand, have resulted in relentless downward pressure on wholesale prices. 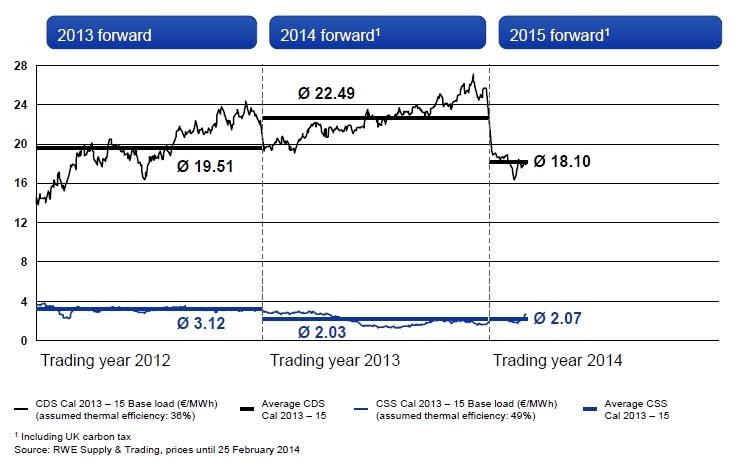 The average variable cost of plant on the margin is falling, reducing power prices. Gas plant is now largely out of merit, with coal and increasingly lignite dominating marginal price setting. Wind and particularly solar output are acting to flatten within-day price shape, which tends to negatively impact gas and coal plant margins. These factors are common across European power markets as renewable capacity expands. But they are particularly pronounced in Germany given the scale of renewable roll out. And Germany is exporting these effects across NW Europe (e.g. to the Netherlands where gas plant load factors have plummeted). The impact on German coal plant (clean dark spread) and gas plant (clean spark spread) generation margins is shown in Chart 1. Coal plant margins are currently weak compared to historical levels. But they have held up relatively well given the decline in German power prices. Falling coal plant revenue has been offset by falling fuel costs (as coal prices have declined), and with coal plant predominantly setting marginal prices, margins have been relatively stable. Coal margins are facing renewed pressure from around 10GW of new coal & lignite capacity coming online between 2011-14. But importantly going forward, coal plant are somewhat insulated from rises in carbon prices, given that these tend to feed through into higher power prices with coal on the margin. The story for German gas plant is not a happy one. Given gas plant is out of merit, falling coal and power prices have caused sharp declines in spark spreads. As spreads head deep into negative territory, gas plant are suffering negative cashflow as they absorb fixed costs. Revenue opportunities are focused on reserve payments and increasing volumes of capacity is being closed, mothballed or signed over to TSOs to provide system support. Gas plant margin recovery hopes are firmly focused on implementation of a capacity market (being discussed for later this decade). Renewable build in the UK is having a similar impact to Germany, but on a smaller scale (and with less solar capacity). The key difference between the two markets is the large volume (~30GW) of CCGT capacity that dominates marginal price setting in the UK. This results in a very different generation margin environment, shown in Chart 2. Spark spreads in the UK are weak. About a third of UK gas capacity runs at zero or very low load factor. But they have been relatively stable, avoiding the dive into negative territory seen in Germany. It is difficult to envisage a scenario in the next decade where UK gas plants are driven off the margin as has happened in Germany. 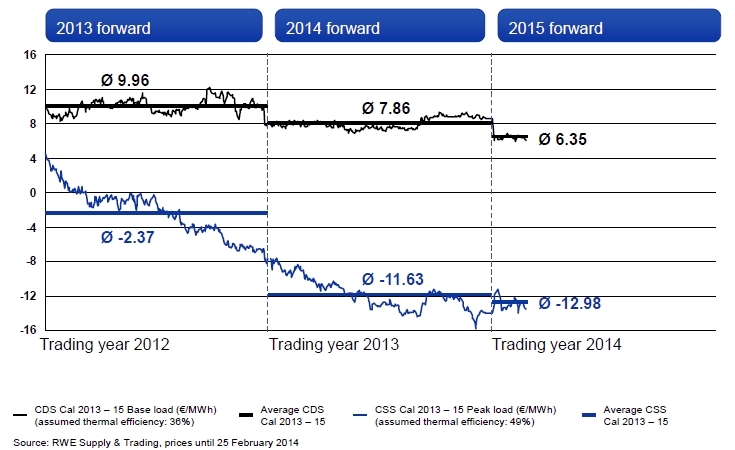 But at current spark spreads, CCGTs are struggling to recover fixed & capital costs. And the UK market hangs precariously in the balance awaiting a tightening capacity margin and implementation of the capacity market. The story for UK coal plant margins has been a more positive one. Generators are earning relatively strong margins given rents from higher cost gas plant setting marginal prices. But UK coal plant are more exposed to increases in carbon cost given gas plants are on the margin, as can be seen more recently in Chart 2. Coal generators are facing the combined impact of carbon backloading (although this appears to be fading) and the rising UK carbon price floor. The government’s freezing of UK carbon price support announced this month has improved the margin outlook for coal plant later this decade. But UK generators are facing some key investment decisions around capex spend to ensure IED (EU emissions law) compliance if they want to run beyond 2023. A comparison of Germany and the UK illustrates the difference between markets where coal vs gas plant set marginal prices. German market dynamics are increasingly driving generation margin behaviour in neighbouring markets. The UK in contrast remains relatively insulated from these effects given limited interconnection and large volumes of gas capacity. But a common theme across both markets is the battle that policy makers face trying to decarbonise their power sectors in a world awash with cheap coal.